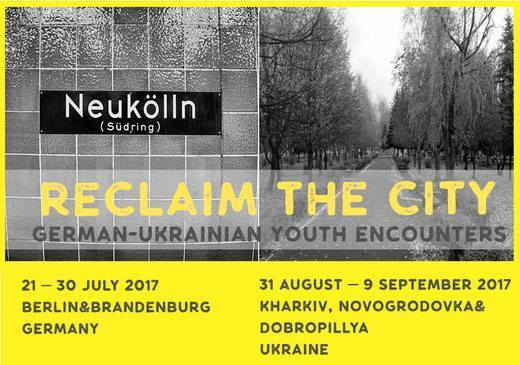 This summer one of our board members, Melissa, was involved in an inspiring project, Reclaim the Hometown, that was initiated by the tireless and wonderful people from Kulturlabor Trial&Error. The exchange, between Ukraine and German residents, was comprised of two 10-day get-togethers, the first in Berlin and the second in Kharkiv and neighbouring towns in Ukraine. Exploring the Lefebvrian notion of ‘the right to the city’, alongside our plural understandings of ‘creative activism’, we participated in a series of workshops and later planned and enacted various actions. A common interest that we shared was a desire to not only stand against but also to step beyond, creatively prefiguring alternatives on the ground, in the here and now. Among the various actions, there were two that I was involved with in Berlin. The first was an S-Bahn living room occupation. The starting point for this action centred on three concerns. Firstly – in no order of importance – we shared a desire to challenge the increasing privatisation of public spaces and services and the surveillance and policing that comes hand-in-hand with this. Secondly, we wanted to suggest alternative ways of inhabiting the city together vis-à-vis the increasing atomisation we experience under neoliberal capitalism. And, finally, we sought to dismantle the discomforts and stigmas surrounding the use of public transport, to get people out of their cars and put a stop the rapid destruction of the environment. We gathered together at our closest train station, entering the same train wagon, but at different entrances. We aimed to appear not as one mass or group of people, but instead a collection of individuals or smaller groups as to make people feel welcome to join and enjoy. By creating a ‘living room’ in the S-Bahn – complete with curtains and wall hangings, rugs, coffee tables and macrame plant hangers – we wanted to break down the individualised experience of travelling with public transport, to connect and experience the power of play and collectivity. We played live music and card games, drank tea together and a whole range of other activities one would not expect to find on their evening commute. The second key action I was involved with was a mobile swap-shop. We created a DIY mobile structure from which we could hang the donated clothes and incorporate a changing room inside, and then we wheeled it through the streets to begin our journey outside H&M (which, unsurprisingly, the manager wasn’t overly happy about). We wanted to challenge our consumer and throw-away culture, alongside the norms crafted by the fashion industry – an industry that is based on very problematic working and production conditions – by elevating and bringing playfulness to sharing and swapping. These actions were about more than protest and resistance: they were about creating the alternatives we wish to see – on the ground, in the streets, and in the train wagons. Moving beyond negation, we were able to create a small, albeit momentary, glimpse of the sort of world we want to inhabit through collective action and play.